Our Kids' Blog » Blog Archive » Play or Sleep? Sometimes it is hard to decide what you want to do – play or sleep. 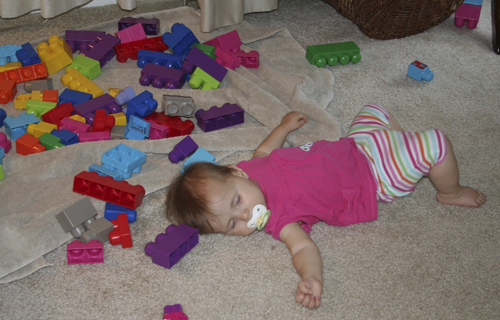 While Emily was napping, Julia was playing with Emily’s giant lego blocks. She had so much fun playing with them she decided to take a quick nap. How cute is this? Well, cute enough for me to snap some photos and then move her to a safe, dark, quiet location. I didn’t want her to roll onto a block in her sleep. Posted in Julia Pics | Comments Off on Play or Sleep?